Courses for Radiologists, Cardiologists, and other Physicians using medical images as part of their practice. Includes courses for Fellows, Residents, and Interns. Most courses provide Category 1 CME credit. This Cardiac CT program offers 20 hours of didactic lectures on patient selection, preparation, imaging principles and techniques, contrast material, cardiac anatomy, assessment of cardiac function and pathology. Training activities include observation of the acquisition of 50 patient examinations and hands on 3D post processing sessions. A review of over 150 Coronary CTA cases to demonstrate the variety of pathology which can be evaluated by CT. A minimum of 100 cases will be reviewed during the 5 days of the course. Participants will be evaluated by means of practical tests demonstrating proficiency with the use of the workstation. A home study program follows the onsite training. Interpretation of 50 case studies and other elements of the course are submitted for course completion while monitored by the education department. This course meets Level II certification guidelines for the ACC and ACR.$6,395.00 tuition only. To register or receive additional information contact Susan Orr at 410-550-0849 or sorr@jhmi.edu. Scheduled Class Dates: 2018 dates: Jan 8-12 and Feb 12-16. 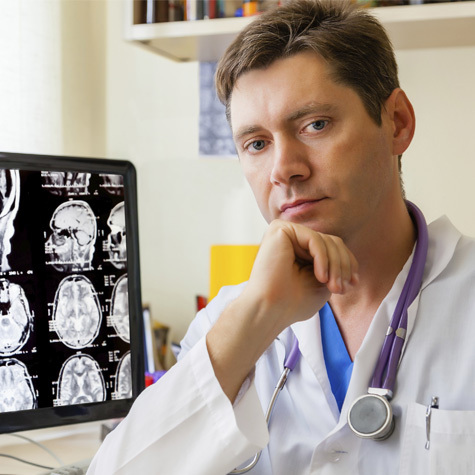 This 3-day course is designed for certified neurologists, neurosurgeons, radiologists, and neuroradiologists interested in training in the workflow for the acute stroke patient. It provides hands-on workshop-type training in whole brain CT perfusion acquisition, interpretation, image processing, and case reporting. The curriculum includes observations of neuro CTA studies, recorded lectures, learning modules, textbooks, articles, and Vitrea FX workstation training.